Every table setting needs a substantial, high-quality plate to serve a main course, salad, or larger dessert, and this Cherry Blossom Dinner Plate should be your choice. Measuring 9-3/4” in diameter, it is a striking plate to augment your Asian ceramicware collection, whether you mix and match this plate with other patterns or arrange it with pieces from the Blooming Blue and White Cherry Blossom Dinnerware Set. This Japanese plate showcases its blue and white cherry blossom design with a wavy, brown edge that is slightly raised and undulated. 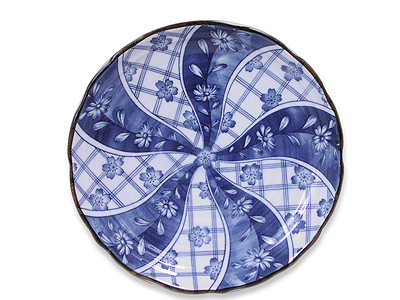 The inside of this Cherry Blossom Dinner Plate has cheerful, blue cherry blossoms, which give the collection its name, against a dual pattern of blue and white plaid and solid, light blue. These rotating backdrops mirror the wavy edges of the plate.